Writers who got tricked into fundraising. Fundraisers who got tricked into writing. Either way, there's a learning curve – and an unlearning curve – for writing fundraising. Because fundraising writing is weird. So many people get thrown into the work of writing fundraising without ever being told about the weirdness they need to live with – and master – if they're going to succeed. Until now. My third book, How to Turn Your Words into Money is specifically and tightly aimed at helping you write better fundraising. How to tell a great story even when you don't have a story. The most common traps for fundraising writers -- and how to avoid them. How to Turn Your Words into Money is basically a cross between Dale Carnegie's How to Win Friends and Influence People (if Carnegie had been a fundraiser) and the Chicago Manual of Style (if it were all about fundraising). It's about writing in all media – print, digital, and broadcast. It's about the issues that trip up fundraising writers and (maybe more important) their bosses. 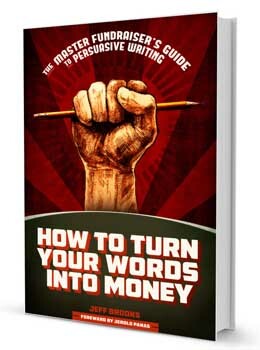 Whether you're working on your very first fundraising writing assignment or you're a seasoned veteran ... whether you want it for yourself or need to show someone else how the pros write fundraising – or both – How to Turn Your Words Into Money is a transforming guide you'll keep on your desk and return to again and again.